We are at the start of a new wave of management. The recent financial crisis highlighted problems not just in the economic system, but also in the way that many companies are governed and managed. Now modern management has reached its end game and we approach a new era in leadership. Rather than the certainties of command and control, this new epoch will be based on co-operation and commitment. There has been a strategic revolution - instead of following the rules, we now have to make them. For some this represents great risk; for others it is an enormous opportunity. 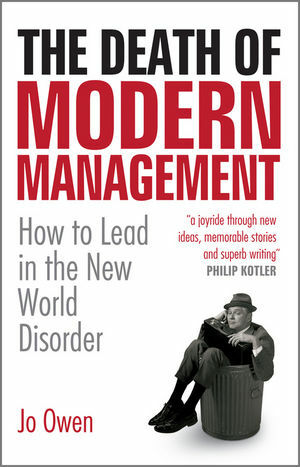 The Death of Modern Management is a how-to guide for surviving and thriving amidst the new uncertainties of contemporary business. "Jo Owen gives a fascinating insight into how 21st century management now works. It is helpful to have someone with his experience, intellect and vision explain the radical changes in a way that makes sense and is immediately usable." .He was the best nappy salesman in Birmingham and put the blue speckle in Daz. He led a business in Japan for three years, has been a partner at Accenture, and was the architect of what is now HBOS business banking. He is the co-founder is four charities: Teach First, which is now one of the UK's top graduate recruiters, Future Leaders and Teaching Leaders, which develops leaders for urban schools and StartUp, which helps offenders start their own businesses on release from prison. He is the author of the classic books How to Lead, How to Manage and Tribal Business School. Chapter 1 Strategy: From Following the Rules to Making the Rules. Chapter 2 Marketing: From Selling Benefits to Selling Dreams. Chapter 3 Power: Shifts to a New World Disorder. Chapter 4 Money: From CAPM to the Road to Ruin. Chapter 5 Information: From Deficit to Hyperinflation. Chapter 6 Knowledge: From Ignorance to the Disintegration of the Firm. Chapter 7 Organisations: From Compliance to Commitment. Chapter 8 Change: Why Dinosaurs Can’t Dance. Chapter 9 Employees: From Slavery to Freedom (and Back Again). Chapter 10 Managers: Power and Making Things Happen. Chapter 11 Leaders: No More Heroes.